Call Tracking Settings is managed at the Offer Level. From the Offer Menu within the Offer Window, Click on Settings and Select Call Routing Tab. Speech Voice: The Text-To-Speech voice. There are two options (Man, Woman). Speech Language: The Text-To-Speech Language. Call Recording: The option to Record Calls or No. Transfer Audio: This is the Audio file the caller will listen to while attempting to transfer the call to an Advertiser. Number Days: The number of days to mark this call as a Repeat Call. Setting Number of Days to 30. If the same caller call twice within a 30 day period of time and the call has been transferred, then the call will be marked as a repeat call. Transfer Repeat Call: The option to Transfer Repeat Calls or Not. If this setting is unchecked, the Caller will listen to the Fail Transfer Message. Route Repeat Calls to Original: If checked, Repeat Calls will always be transferred to the same advertiser. Pay For Billable Calls: If checked, Repeat Calls will be paid for. If unchecked, and is Repeat but the first call was not billable and the second call is billable, then the call will be marked as a Billable Call. This is the message the caller hears when the schedule is not open for all Advertisers. 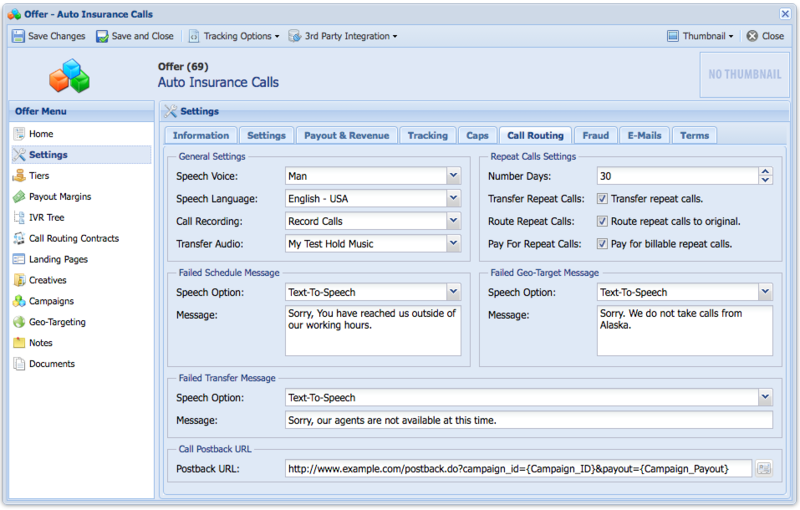 Speech Option: Text-To-Speech or Audio File. Message: The message that will be played to the caller when the call fails the schedule. Audio File: If you select Audio File, then you can choose the Audio File to Play. This is the message the caller hears if they fail Geo-Targeting. Message: The message that will be played to the caller when the call fails Geo-Targeting. The Postback URL the system will call when the call is paid for. You can pass tokens to the Postback URL. 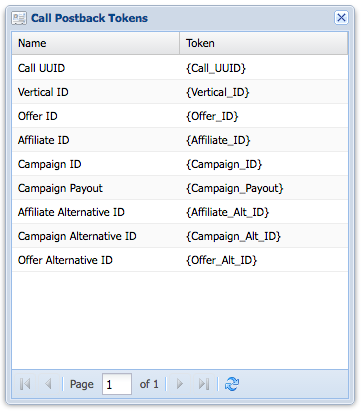 The tokens window will show all available tokens for use.